If you remember from last week, I was rather concerned about our tomato seedlings that seemed to be showing signs of a rather disastrous problem. They looked to be in the throes of a debilitating nutrient deficiency. Well, after a week and some TLC, (TLC being defined as not much watering, but watering with fertilizer when possible) most of the tomato seedlings seem to be coming out of it. So, most of the plants are showing normal, green growth. In other words…showing signs of normal growth and health. There are still a few that are looking very undersized and wimpy. I have my doubts about whether or not they will ever amount to anything. 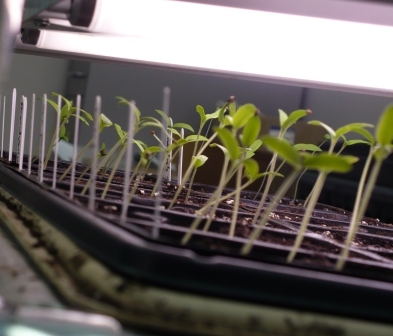 On the other hand, the new seedlings I planted early last week are looking good…if a bit gangly. I finally realized why…my bottom layer of lights only has 2 working bulbs, rather than 4. That’ll make a difference! Here I’d been thinking it was just a matter of being so far from the windows that they weren’t getting any supplemental light! So…yeah, I’m just going to call this shot “artsy” and let it go at that. No, your eyes aren’t going bad. I think my camera skills might be though. 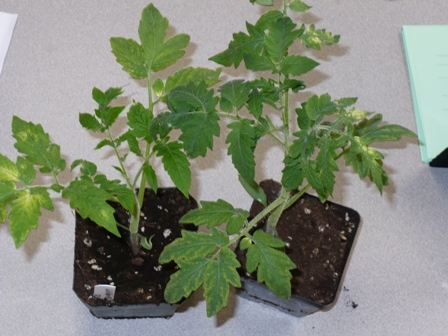 Posted on April 13, 2010, in Plant Problems & Diseases and tagged indoor seeds, plant diseases, seed starting, Spring, Tomatoes. Bookmark the permalink. Leave a comment.